The fastest and most convenient method of ordering is our secure online shopping cart. If you prefer not to order using our secure cart, you may send us an email, advise your phone number, and we will promptly call you back. ImportFood.com accepts Visa, Mastercard and American Express. Can I write a personal check or money order? We do accept check and money order payment, just send us an email and advise your shipping address as well as the items you'd like to order. We'll quickly respond to confirm how to proceed. At ImportFood.com we take the shipping of your products very seriously. Most orders are shipped immediately via Fedex Ground from our warehouse in Seattle, Washington. We also use USPS Priority Mail, USPS Parcel Post, and Fedex Smartpost. Based on our experience most shipments arrive within 5-7 days. Ground shipping costs are based on flat fee of $6.75 plus a small added charge per ounce. Orders are shipped Monday through Friday, excluding legal holidays. Does ImportFood.com service international destinations? Currently we can ship to addresses in the United States, US Territories served by the US Postal Service, and to APO/FPO addresses. We also ship to Canada and other destinations as per policy explained below. What if I live in Alaska, Hawaii or the US Territories? ImportFood.com offers US Priority Mail or Parcel Post to our customers in Alaska, Hawaii, or the US Territories. We encourage orders from Alaska and Hawaii, as we can get competitive postal rates from Seattle. You may also place an order online, checkout with Fedex Ground as the shipping method, and before processing the order we'll send you an email to advise shipping costs, then wait for your approval. If you want to know the shipping charge before you order, send us an email: , advise what you would like to order, and we will immediately respond with a custom quotation to explain your shipment options. What states are in the US Territories? Currently shipping to American Samoa, Federated States of Micronesia (Micronesia), Guam, Marshall Islands, Northern Mariana Islands, Palau, Puerto Rico, and Virgin Islands. What if I have an APO/FPO address? We ship to APO/FPO on a daily basis using USPS, and we welcome your business! Please order using our secure online checkout, with Fedex Ground selected as the default shipping method. If the actual shipping charge via USPS Priority Mail is higher than Ground we will email you and await your approval. Usually it's a bit more expensive, depending on the order weight and other factors. No. You can specify one "ship to" address per order. If you need to send items to multiple addresses, please order separately for each address. 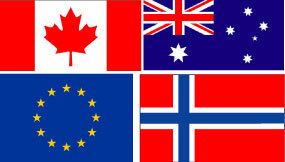 We ship to Canada on a weekly basis, and occasionally to Europe, New Zealand, Australia and Singapore. If you are interested in ordering, please email with a list of items you want to order, and we will respond with a quote for the cost of Airmail. Keep in mind, Airmail is very expensive for most items we sell due to the weight of the item and high cost of shipping. ImportFood.com unconditionally guarantees all merchandise. We would like to assure you that your satisfaction is our highest priority, and any problems you encounter will be worked out to your satisfaction. If you need to return a product for any reason you may return it to us within 30 days for a prompt refund. If for any reason you are dissatisfied, or if your order arrives incorrect, incomplete or damaged, please Email a short explanation of the problem. Please include your order number in all correspondence. You may also call us Toll Free Mon-Sat 8:00 am to 5:00 pm PST 888-618-8424. Fax 425-687-8413. As you complete your order, you'll be asked for your name, address, and credit card number. We use Secure Sockets Layer (SSL) technology to handle the entire transaction. SSL sends your number in an encrypted code, which only we can decode. Since 1997, there have been no reports of credit card information stolen on the World Wide Web during a transfer of information over a SSL line. Experts point out that an on-line transaction without humans is far safer because the information is immediately encoded into a 128 character block that can only be decoded by a computer on the other side. This information is sent to a credit card payment processor to validate the name, address, and credit card number in much the same way that restaurants and stores handle your purchases. After your merchandise has been shipped, your credit card will be charged. Your order form, including encrypted credit card number, is then archived in a highly protected computer. The credit card information cannot be accessed for future purchases. Our transaction system currently works with Web browsers that can use SSL such as Microsoft Internet Explorer, Safari, Firefox and others. Importfood.com guarantees your satisfaction with no exceptions! We offer a 100% unmatched guarantee that allows you to return any product for a complete refund--it's that simple! Our products are fully guaranteed against any defect, faulty workmanship and loss through shipping. If you are in any way unsatisfied with your order, please contact our customer support department at or call us toll free at 888-618-8424 and we'll be happy to help. Please take a look at our Return and Exchange Policy as well. We understand Thai cooking and we understand the ingredients necessary to create authentic Thai meals (see our Company Background). Our Satisfaction Guarantee is our way of proving it. ImportFood.com Inc. Terms of Web Site Use and Disclaimer. All site design, text, graphics, interfaces, and the selection and arrangements thereof are © 1999, ImportFood.com Inc. ALL RIGHTS RESERVED. Permission is granted to electronically copy and to print hard copy portions of this site for the sole purpose of placing an order with ImportFood.com Inc. or using this site as a shopping resource. Any other use of materials on this site, including reproduction for purposes other than those noted above, modification, distribution, or republication, without prior written permission of ImportFood.com Inc. is strictly prohibited. All trademarks, service marks, and trade names (collectively the "Marks") are proprietary to ImportFood.com Inc. or other respective owners that have granted ImportFood.com Inc. the right and license to use such Marks. THE INFORMATION, SERVICES, PRODUCTS, AND MATERIALS CONTAINED IN THIS SITE, INCLUDING, WITHOUT LIMITATION, TEXT, GRAPHICS, AND LINKS, ARE PROVIDED ON AN "AS IS" BASIS WITH NO WARRANTY. TO THE MAXIMUM EXTENT PERMITTED BY THE LAW, IMPORTFOOD.COM DISCLAIMS ALL REPRESENTATIONS AND WARRANTIES, EXPRESS OR IMPLIED, WITH RESPECT TO SUCH INFORMATION, SERVICES, PRODUCTS, AND MATERIALS, INCLUDING BUT NOT LIMITED TO WARRANTIES OF MERCHANTABILITY, FITNESS FOR A PARTICULAR PURPOSE, TITLE, NONINFRINGEMENT, FREEDOM FROM COMPUTER VIRUS, AND IMPLIED, WARRANTIES ARISING FROM COURSE OF DEALING OR COURSE OF PERFORMANCE. IN ADDITION, IMPORTFOOD.COM DOES NOT REPRESENT OR WARRANT THAT THE INFORMATION ACCESSIBLE VIA THIS SITE IS ACCURATE, COMPLETE OR CURRENT. IN NO EVENT SHALL IMPORTFOOD.COM BE LIABLE FOR ANY DIRECT, INDIRECT, SPECIAL, PUNITIVE, INCIDENTAL, EXEMPLARY OR CONSEQUENTIAL, DAMAGES, OR ANY DAMAGES WHATSOEVER, EVEN IF IMPORTFOOD.COM HAS BEEN PREVIOUSLY ADVISED OF THE POSSIBILITY OF SUCH DAMAGES, WHETHER IN AN ACTION UNDER CONTRACT, NEGLIGENCE, OR ANY OTHER THEORY, ARISING OUT OF OR IN CONNECTION WITH THE USE, INABILITY TO USE, OR PERFORMANCE OF THE INFORMATION, SERVICES, PRODUCTS, AND MATERIALS AVAILABLE FROM THIS SITE. THESE LIMITATIONS SHALL APPLY NOTWITHSTANDING ANY FAILURE OF ESSENTIAL PURPOSE OF ANY LIMITED REMEDY. BECAUSE SOME JURISDICTIONS DO NOT ALLOW LIMITATIONS ON HOW LONG AN IMPLIED WARRANTY LASTS, OR THE EXCLUSION OR LIMITATION OF LIABILITY FOR CONSEQUENTIAL OR INCIDENTAL DAMAGES, THE ABOVE LIMITATIONS MAY NOT APPLY TO YOU. This site may contain links to other sites on the Internet that are owned and operated by third party vendors and other third parties (the "External Sites"). You acknowledge that ImportFood.com Inc. is not responsible for the availability of, or the content located on or through, any External Site. You should contact the site administrator or Webmaster for those External Sites if you have any concerns regarding such links or the content located on such External Sites.